If you’re looking to clean up your credit and restore your credit score, you probably don't need the services of credit repair companies or agencies. Right here, you can quite possibly find the help you need to fix and rebuild your credit score as fast as is humanly possible by yourself, for free, without any expensive credit rebuilding or score repair program. All you essentially need to do is follow the five steps below. In addition to this, we also provide links to a number of other great resources to provide you with more help in specific areas. Below we lay out how to restore your credit in Canada. We also have another in-depth discussion on this topic including how to fix your credit score fast (if that’s possible in your case). Make sure the information on your credit reports is accurate. Remove all collection notices from the public records section of your credit report. Reduce all revolving credit balances (credit cards, lines of credit, and overdraft) to under 75% of your credit limits. Then reduce to less than 50%. Make sure that a good amount of credit is available to you that you are not using. If you have bad credit and don’t have any form of good credit right now, consider obtaining a cash secured credit card to rebuild your credit. Here’s where to find the money to do this. Establish a good history of always paying your debts on time with no late payments. In Canada there are two credit reporting agencies Equifax and TransUnion (in the US, there are more). All banks, credit unions, and most lenders report the consumer debt you owe along with your payment history to one or both of these credit reporting agencies. Using this information, these companies create a three digit score that predicts how likely you are to repay your debts. This is called a credit score. Credit scores range from a low of around 300 to a high of 850 or 900 - depending on the company that's generating the score. The higher your score, the more likely you are to repay your debts in full. With a good credit score of 700, it's estimated that there is only a 2% chance that you won't repay your debts as agreed. With a credit score of 750, it's estimated that there is only a 1% chance that you will fail to pay your bills. However, if someone has the lowest credit score of 300, it's estimated that there is a 55% chance that they won't fully repay all their debts. You can learn more about credit scores and the factors that are used to calculate them. Clean up any inaccurate or old information on your credit report. There should be no negative information on it that’s more than 7 years old. If there is, get it removed. Clean up the public records section of your credit report. Get rid of the old parking tickets, unpaid cell phone bill, utility bill, etc. Pay them but arrange for them to be removed at the same time. Pay down any high credit balances as quickly as possible. Carrying a balance over 50% of your credit limit will start to impact your credit score. Balances over 75% of your credit limit will really hurt your score. Make sure you have a fair amount of credit that’s available to you that you’re not using. If you currently don't have any credit or only have bad credit, getting one form of new credit and paying it as agreed can really help your credit score. A cash secured credit card can be a good way to do this. Because banks and finance companies have millions of customers and credit reporting agencies create credit scores for many millions of people, mistakes are going to be made from time to time. Most of the time these mistakes are only minor, but sometimes they are big enough to negatively impact your credit rating. The first thing you should do to restore your credit score is to obtain a free copy of your credit report, and carefully look through it to make sure all the information it contains is accurate. If you find any errors, you can either speak with your creditor who is incorrectly reporting information and ask them to correct it, or you can dispute the information through the credit reporting agency's dispute process. Here is where you can file a dispute with Equifax, and here is where you can dispute something found on your TransUnion credit report. It’s important that you check both of your credit reports with each agency as not all creditors report to both agencies. Each agency also allows you to put a message on your credit report explaining your side of the story if you are unable to resolve a matter (or if your personal information has been stolen and you want to warn everyone to make doubly sure that it’s actually you applying for new credit). Putting a message on your credit report should be a last resort because it usually doesn’t mean much to anyone but you. Most financial institutions have automated lending processes or strict lending guidelines that don’t give front-line employees much room to make an exception for someone who was caught up in a bad situation. You really need to have inaccurate information changed. You can't just try to explain things away. While your explanation might sound great, it’s unlikely to help your credit situation very much. One additional tip for this section would be that if one of the credit reporting agencies is reporting negative information on a debt or a form of credit that is more than 7 years old, you can request that they remove that information because it should no longer be reported. Removing old, negative information from your credit report could really improve your credit score. When you obtain a copy of your credit report, you may notice that it has a number of sections. The main section shows the different types of credit or debts that you have (credit cards, line of credit, overdraft, car loan, student loan, and possibly even a mortgage), what company the credit or debt is with, your credit limit, your payment history for the past 7 years, when the account was opened, when you last made a payment and the amount of the payment. This information cannot be removed from your credit report. It is what the lender’s computer system reports (if there is an error, your lender will need to correct what they are reporting). However, there is a public records section near the bottom of the report that can contain old, unpaid parking tickets a city is reporting, an unpaid cell phone bill, an unpaid utility bill, or a small debt some company claims you owe them. Information in the public records section is not permanent. It can be changed, and it’s usually worth changing because it can have a devastating effect on your credit score. We have seen a lot of people get this information removed from their credit report by contacting the creditor who is reporting it, resolving the matter, and requesting at the same time that the creditor remove the record of the debt from their credit report as part of the debt repayment arrangement. As soon as the public records section is cleaned up and completely clear, your credit score should improve dramatically as long as you don’t have a lot of other derogatory information on your credit report (like a lot of late payments, a bankruptcy, or a consumer proposal). This tip, however, does not work for the main section of the credit report where different types of credit and debts are reported. That information remains on your report for 7 years. If the balance you are carrying on any of your credit cards, line of credit, or overdraft is over 50% of your credit limit, this could be hurting your credit score. One of the big factors in determining your credit score is how much credit you’re using compared to your credit limits. If you have a $5,000 limit on one of your credit cards, and your balance is $500, then you are using 10% of your limit. However, if you have a balance of $4,500 on the card, then you’d be using 90% of your credit card’s credit limit. If you were the credit card company, what would you do if someone in the first scenario asked you for a credit limit increase? Since they only have a balance of $500, it would appear as though everything is fine, and they are using the credit responsibly (since they have another $4,500 in credit they could use but are not). However, if someone with the second scenario asked you for a credit increase, you may be a bit more cautious and ask a few more questions. If all their other credit cards are close to being maxed out and they don’t have any savings, one emergency, job loss, or illness could push them into a bad situation where they might have difficulty repaying their debt. This is why the amount of debt you are carrying compared to your credit limits is important to lenders. It’s one way of estimating how much room you have before you have a problem. By now you’ve probably figured out that getting close to the maximum limit on your credit cards and other forms of revolving credit (lines of credit and overdrafts) is not viewed as a good thing by the credit reporting agencies. You actually don’t want to use more than 75% of your credit limit. Doing this will significantly hurt your credit score. If you don’t want to hurt your credit score at all, make sure all your balances are under 50%. Reducing them to under 30% will make you look even better. Continuing our discussion of credit limits, based on the information outlined above, you can see that if you are not carrying a balance on a credit card or line of credit of more than 30% of your credit limit, you’re going to have a lot of credit that’s available to you that you’re not using. This is one of the best ways to restore your credit score: have a good amount of credit that’s available to you but don’t use it. This shows that you are not only responsible, but it makes it unlikely that an emergency or minor financial setback could derail your finances and prevent you from being able to repay your debts. Having a good amount of credit available to you doesn’t mean you have to have a $20,000 credit limit. 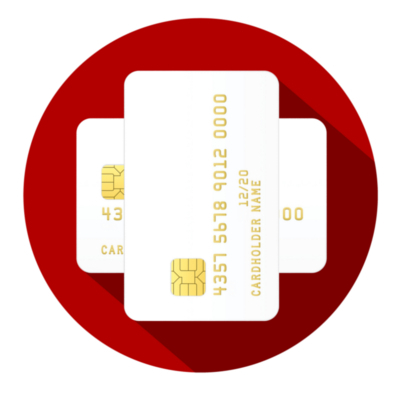 If you have a $3,000 credit limit, but never carry more than a small balance on the card, this should work fairly well at enhancing your credit score. If you have bad credit and no one wants to offer you new credit right now, you could save up some money and get a secured credit card. To get this type of credit card, you put down a certain amount of money as security for a credit card and you receive a certain limit in return. Cash secured cards start at round $200 to $300, and your cash deposit guarantees the credit card issuer that they will be paid. In a worst case scenario, they could close your card and use your cash deposit to pay off your outstanding balance (this would really hurt your credit score: a credit account being closed by the creditor for non-payment. So don't ever let this happen if you can help it). If you’ve heard the sales pitch of credit repair companies and are wondering whether a loan or a credit card is the best way to repair your credit, here are our thoughts on which one is better (our review of the pros and cons). If you’re wondering where to get a cash secured credit card, here is a list of cards to have a look at. Just select your province and then you can compare the cards. Here is another list with a few more cards that aren't included on the first list. If you’re left scratching your head wondering where you’re going to find the money for the cash security on a card, here are a whole bunch of ideas of places you might be able to find it. Without question, the very best way to bring about the restoration of your credit is by always paying your bills on time and establishing a solid payment history with no late payments. This takes time, and that’s often what people with bad credit don’t like to hear. But that’s the way the credit system is built. It’s built to recognize good payment credit history over time. If you have had a particular credit card or line of credit for a long time, you can use this aspect of the credit reporting system to your advantage. The credit scoring system likes to see a lot of history. If you can clean up a credit card that was opened many years ago and establish a new history of no late payments, the age of the account can help restore your credit as the old late payment history falls off over time. How Long Does It Take to Repair Credit in Canada? Credit reporting agencies typically update their records once a month. So when you do something to improve your credit, you should normally expect to have to wait a month or two for those changes to be reflected on your credit report and in your credit score. If you have negative information on your credit report, you typically have to wait for that information to fall off 7 years after the negative event (like missing a payment or being super late with a payment) took place. Based on these two factors, this should give you a sense of when to expect changes to occur in your credit score. The only ways you can dramatically boost your credit score within a month or two is by cleaning up the public records section of your credit report (as discussed above), paying down a substantial amount of debt if you are close to your credit limits (also discussed above), or getting a creditor or the credit bureau to stop reporting negative information that is more than 7 years old. Here are some more tips that answer a number of questions or concerns people often have when they’re trying to rebuild their credit. The information here should help you do a better job of fixing your credit yourself. Closing a credit card doesn’t make it go away. All records remain on your credit report for 7 years before they fall off. Once a credit card account is closed or an installment loan is paid off, the record of that credit facility along with its payment history and the reason why it was closed will remain on your credit report for 7 years (closing a credit account on your own is fine. Having it closed for you by a creditor because you didn’t pay the debt as originally agreed is very negative). Once you pay off a credit card, don’t rush to close it unless you know you’ll be tempted to use it again. Having credit that’s available to you but that you’re not using usually helps improve your credit score. Freeze your paid off credit cards in a block of ice in your freezer if you think they might be a temptation. That way if you want to use them, you’ll have to wait for the ice to thaw, and that will give you time to re-consider your decision. If you really want to close credit cards, it’s usually best to do so gradually over time – as long as you have other forms of revolving credit with many years of history and decent credit limits. Don’t open new credit accounts too quickly unless your credit is really bad and you need a complete fresh, new start. Part of your credit score is determined by the average of how long your credit accounts have been open. Opening a bunch of new credit accounts can significantly lower your average account age and make it look like you are an over-eager credit seeker. Restoring your credit by taking out a loan can work, but it seems to take longer than re-establishing credit by getting a form of revolving credit such as a credit card, line of credit, or overdraft. The reason for this seems to be that a loan starts out at its “credit limit” and then gets paid down over time (even though you cannot take a loan back up to its original amount again without re-applying for and re-issuing the loan). A revolving form of credit such as a credit card or line of credit, starts out with a zero balance. This starts you out a long ways away from your credit limit and boosts your credit score faster. If you are shopping for the best rate on something, keep all the credit enquiries confined to a few days. Normally each credit enquiry will lower your credit score by a very small amount. However, the credit reporting agencies recognize that it’s normal for people to shop for the best rate when they are making a major purchase, so they will allow multiple enquiries within a few days to count as one hit on your credit report rather than as many. If, however, you spread out your rate shopping over a number of weeks and your credit report is pulled multiple times during this period, then this will have a greater negative impact on your credit score. Pay for stuff using cash or debit. Studies show we all spend more when we buy things (including food) on credit. Once the money’s done, you should be too. The shopping should stop there. Don’t feel down when this happens. You can shop some more – once you have more money (cash not credit). Create a spending plan or budget and follow it. Even if you’re not very good at following a budget, you can at least look at your bank balance, remember what expenses you have this month and then decide on how much money you can afford to spend – before you go to the store. Always spend a little less than you think you can afford. Unexpected expenses always seem to pop up. To make budgeting way easier, we’ve created an intelligent budgeting tool that will guide you through the process, make it much easier, and help you get a firm grip on how much money you have to spend. Hopefully you found enough direction here to begin your own credit restoration process. We’ve basically provided you with the essentials of what the expensive credit repair companies offer – only we’ve given it to you for free. It’s not possible to cover absolutely everything here. If you still have some questions, here’s how to get them answered for free from an expert. If you’re thinking of getting a mortgage any time in the next few years, you could find a good mortgage broker, explain your situation, tell them you’d like to get a mortgage through them, and ask for their advice on how to fully restore your credit. If they’re a quality professional, they’ll help you out and then hopefully you can reward them with you business in time. You could also ask to speak with a loans officer at your bank, let them know some of your future plans that involve working with them, and ask them for advise on how to repair or rebuild your credit. If your credit is really bad, feel free to contact a non-profit credit counselling agency. One of their professional credit counsellors will likely be happy to help your figure out how to fix your credit score for free (they receive funding to help the public for free). Below are a few more resources that you may be interested in too.